USGS Data Management Plan Planning for a project involves making decisions about data resources and potential products. A Data Management Plan (DMP) describes data that will be acquired or produced during research; how the data will be managed, described, and stored, what standards you will use, and how data will be handled and protected during and after the completion of the project. A DMP is required by current USGS policy for all projects beginning after Oct. 1, 2016. Data and Model Driven Hydrology Education This collaborative project, involving Purdue University, Arizona State University and Carleton College, is funded by the National Science Foundation's TUES program. This project has the following objectives: (i) Develop a prototype for an online collaborative environment which allows educators to publish and share their contributions in a structured manner. (ii) Develop a small set of data and modeling driven modules that will be used and tested at undergraduate hydrology classes at Purdue, Arizona State University, and Chandler Gilbert Community College. (iii) Assess the effectiveness of a data/modeling based pedagogical approach to hydrology by implementing the new curriculum material in university classrooms and comparing it side-by-side with the traditional lecture-based approach. (iv) Initiate a structured process of collaborative community curriculum development to bring together a core user community that will contribute to the collaborative curriculum content, and whose needs and feedback will drive the design of the online collaborative environment. Provenance: Venkatesh Merwade, Purdue University-Main CampusReuse: This item is offered under a Creative Commons Attribution-NonCommercial-ShareAlike license http://creativecommons.org/licenses/by-nc-sa/3.0/ You may reuse this item for non-commercial purposes as long as you provide attribution and offer any derivative works under a similar license. Accordingly, this website is developed for hydrology instructors to use the modular units developed in this project in their classes to augment their current teaching. The units are developed to include data analysis using precipitation, streamflow and topography data. Some units also involve hydrologic and hydraulic modeling using HEC-HMS and HEC-RAS. Each unit is developed as a set of steps that can be finished in sequence to complete a single unit. Each step is a stand-alone learning activity and steps from multiple units can be combined to create a new unit. For example, if an instructor is interested in teaching rainfall runoff relationship, steps from current precipitation and streamflow units can be used and connected in a new sequence to accomplish the learning objectives. If the new unit needs an additional steps, instructors will be able to create this new step, and incorporate it in the new sequence to create a new standalone unit. Similarly, an instructor can create a new unit by using just one step instead of a sequence of steps. A schematic of what each unit may contain and how its modules will interact is presented in the figure to the right. U.S. Drought Monitor The U.S. Drought Monitor, established in 1999, is a weekly map of drought conditions that is produced jointly by the National Oceanic and Atmospheric Administration, the U.S. Department of Agriculture, and the National Drought Mitigation Center (NDMC) at the University of Nebraska-Lincoln. 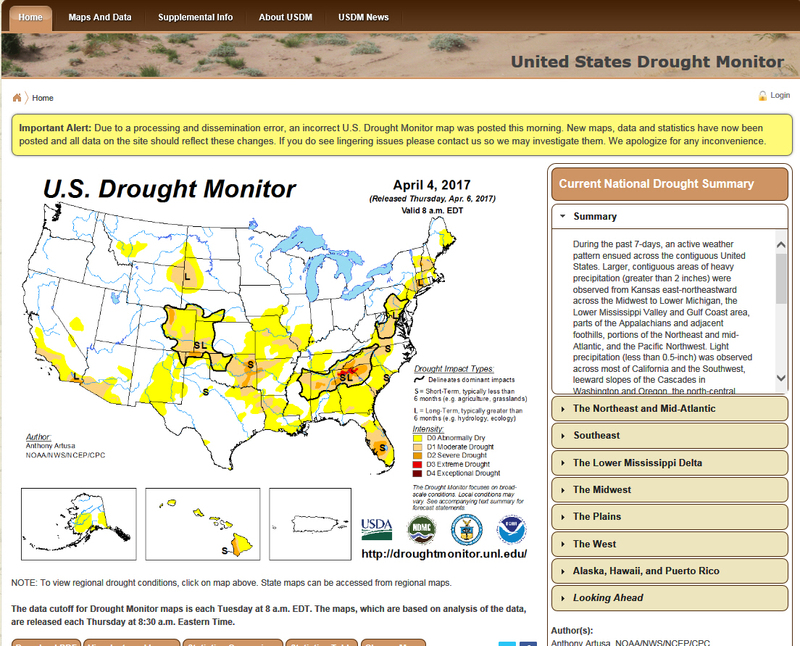 The U.S. Drought Monitor website is hosted and maintained by the NDMC.U.S. Drought Monitor maps come out every Thursday morning at 8:30 Eastern Time, based on data through 7 a.m. Eastern Standard Time (8 a.m. Eastern Daylight Time) the preceding Tuesday. The map is based on measurements of climatic, hydrologic and soil conditions as well as reported impacts and observations from more than 350 contributors around the country. Eleven climatologists from the partner organizations take turns serving as the lead author each week. The authors examine all the data and use their best judgment to reconcile any differences in what different sources are saying.Countries around the world have sought to emulate the U.S. Drought Monitor. We stress that it isn’t a strictly quantitative product, and that the community of drought observers lends credibility to the state-of-the-art blend of science and subjectivity that goes into the map. The U.S. Drought Monitor, a composite index that includes many indicators, is the drought map that policymakers and media use in discussions of drought and in allocating drought relief. The U.S. Department of Agriculture’s Farm Service Agency used the U.S. Drought Monitor to distribute an estimated $1.64 billion from 2008 to 2011 through the Livestock Forage Disaster Program; $50 million in 2007 through the Livestock Assistance Grant Program; and additional funds through the Non-Fat Dry Milk Program in 2003 and 2004. The Internal Revenue Service also uses the U.S. Drought Monitor to determine the replacement period for livestock sold because of drought. As part of its response to the drought of 2012, the U.S. Department of Agriculture streamlined the process for secretarial disaster declarations, making declarations nearly automatic for a county shown in severe drought on the U.S. Drought Monitor for eight consecutive weeks. Water Data Portal -IWMI The International Water Management Institute (IWMI) has been doing research on water for the last 30 years. Being a non-profit research organization all the research outputs and data used for the research are shared with researchers across the globe as a global public goods (GPGs). The Water Data Portal (WDP), following "one-stop shop" approach, provides access to a large amount of data related to water and agriculture. WDP contains meteorological, hydrological, socio-economic, spatial data layer, satellite images as well as hydrological model setups. The data in the WDP, both spatial & non-spatial, are supported by the standardized metadata and are available for download by user including academia, scientists, researchers and decision makers. However, access is provided in compliance with copyrights, intellectual property rights and data agreements with our partners. The portal is maintained by GIS, RS and Data Management (GRandD) Unit to facilitate sharing and reuse of data. Water Footprint Network The Water Footprint Network was founded in 2008 to solve the world’s water crises by advancing fair and smart water use. We are a dynamic, global network that drives innovation and inspires the changes we must all make to share fresh water fairly amongst all people to sustain thriving communities and nature’s diversity. Recognising the value of the water footprint, international leaders came together to establish a network of organisations committed to using science-based, practical solutions and strategic insights to transform the way we use and manage our water resources.Our Strategic Plan will guide and shape our work until 2020. It sets out our aims, principles, plans and priorities and describes the unique contribution that we will make in addressing today's water challenges by providing science-based, practical solutions and strategic insights to companies, governments and citizens.Over 200 partners from large companies to small-scale suppliers, financial institutions and regulatory bodies, non-profit organisations and academia have chosen to join our network. Together, our continuous learning community shares the latest advances in knowledge, information and ideas to escalate change in river basins worldwide.Our international staff are dedicated to transforming awareness of the water footprint into concrete action towards sustainability. They bring a broad range of expertise to advance knowledge in and application of Water Footprint Assessment and work with others to apply it. To share the latest advances, exchange learning and to keep abreast of emerging issues and developments, our team and partners actively engage in multi-stakeholder initiatives and contribute to key, influential international and regional events. Communitiy Surface Dynamic Modeling System (CSDMS) ■ What is CSDMS? - The Community Surface Dynamics Modeling System (CSDMS) deals with the Earth's surface - the ever-changing, dynamic interface between lithosphere, hydrosphere, cryosphere, and atmosphere. We are a diverse community of experts promoting the modeling of earth surface processes by developing, supporting, and disseminating integrated software modules that predict the movement of fluids, and the flux (production, erosion, transport, and deposition) of sediment and solutes in landscapes and their sedimentary basins.■ History - The CSDMS Project is an NSF-funded, international effort to develop a suite of modular numerical models able to simulate the evolution of landscapes and sedimentary basins, on time scales ranging from individual events to many millions of years. CSDMS is an acronym for Community Surface Dynamics Modeling System. Ideas behind the CSDMS concept were discussed by participants of an international workshop, Numerical Experiments in Stratigraphy (University of Kansas, May 15-17, 1996), with formal presentation of these findings at the third annual conference of the International Association of Mathematical Geology (Barcelona, 1997: Syvitski, et al, 1997). The formal CSDMS idea, however, took shape at a panel convened by the Geology/Paleontology Program of NSF in March 1999. That panel identified a CSDMS as a high priority NSF research initiative in sedimentary geology, and since then the concept has been widely discussed in the North American sediment-dynamics community. The history behind CSDMS began in the mid-1960s, with a very interesting article (Bonham-Carter and Sutherland, 1967; also see Harbaugh and Bonham-Carter, 1970). Graeme Bonham-Carter coded up sediment transport equations related to a river's discharge into the ocean, to provide us with new insights into the formation of sedimentary deposits. The exercise was completed at a time when application of the Navier-Stokes equation to sediment transport remained in its infancy, and when we fed computer cards into memory-poor, slow-speed mainframes. Ten years later saw the first volume describing the full spectrum of numerical models related to ocean dynamics (Goldberg et al, 1977). The emphasis of these articles was on getting the dynamics correct and this resulted in some papers (e.g. Smith, 1977; Komar, 1977) being conceptually ahead of available field tools and data. Through the next decade, as computers advanced with our ability to develop code, the softrock community applied its maturing understanding of hydraulics and sediment transport to the formation and modification of sedimentary deposits. In 1988, a large representation of this community met in the mountains of Colorado, and the concept of quantitative dynamic stratigraphy (QDS) was born (Cross, 1989). At the meeting, a mechanistic view of QDS was contrasted with the more rapidly maturing rule-based (sometimes known as geometric-based) stratigraphic models (see Syvitski, 1989, for discussion). The need to understand local to regional boundary conditions, either over long periods of simulated time, or for conditions where we have little field data (i.e. extreme event modeling) went on to change the way sedimentologists conducted their field and numerical experiments. Through the next decade, the QDS community and discipline grew and influenced the field of both sedimentology and stratigraphy (Agterberg and Bonham-Carter, 1989; Martinez and Harbaugh, 1993; Franseen et al., 1991; Harff et al., 1998; Harbaugh et al., 1999; Paola, 2000; Syvitski and Bahr, 2001, Syvitski et al.,, 2007). Now we approach a time when these marvelous individual efforts can be multiplied in their effectiveness if better coordinated, and openness is developed between the modelers and field-oriented geoscientists. The earth system surface dynamic models, like the established Community Climate System Model or the Regional Ocean Modeling System, are based on algorithms that mathematically describe the processes and conditions relevant to water, sediment and solute transport, and would incorporate all the important input and boundary conditions that define an environmental system. The CSDMS effort is coordinated and funded by government agencies and industry, to support the development of optimum algorithms, input parameters, feedback loops, and observations at the relevant scales necessary, to better provide an understanding of earth-surface systems. The Community Surface Dynamics Modeling System is being designed to address issues, for example, when the earth was abiotic, hotter or colder, when there was no flocculation, when the moon was closer, or the oceans were more saline. CSDMS provides modeling support to those working on modern environmental applications, future global warming scenarios, natural disaster mitigation efforts, natural hazard efforts, reservoir characterization, oil exploration, and national security. New satellite and geophysical databases will only realize their full potential in collaboration with efforts like the Community Surface Dynamics Modeling System. International Water Law Project Created and directed by Gabriel Eckstein, the mission of the International Water Law Project (IWLP) is to serve as the premier resource on the Internet for international water law and policy issues. Its purpose is to educate and provide relevant resources to the public and to facilitate cooperation over the world’s fresh water resources. As the subject evolves and develops, the IWLP will continue to update its pages and databases. We welcome and appreciate contributions and submissions including new publications, URLs, news stories, cases, corrections, and comments. To contact the IWLP, please use our contact form. CUAHSI Founded in 2001, the Consortium of Universities for the Advancement of Hydrologic Science, Inc. (CUAHSI) is a 501(c)3 research organization representing more than 130 U.S. universities and international water science-related organizations. CUAHSI receives support from the National Science Foundation (NSF) to develop infrastructure and services for the advancement of water science in the United States.